I was given a little project to find a toy and draw it from different angles, so I used a small range of mediums and focussed on different parts of a gun toy I had. These are a handful of drawings from my sketchbook. I used the complementary colouring pencils blue and yellow for these drawings. 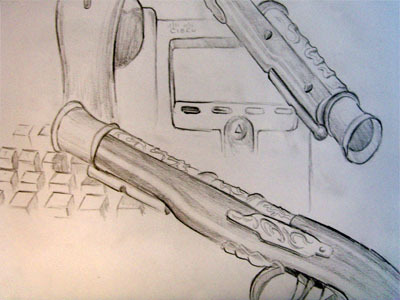 This is my favourite drawing because of the gleaming effect I created by blending, and the selective use of colour. These drawings were quick line drawings using fine-liners, the result feels like more of a technical drawing. I tried to vary line thickness and use hatching to shade certain areas. 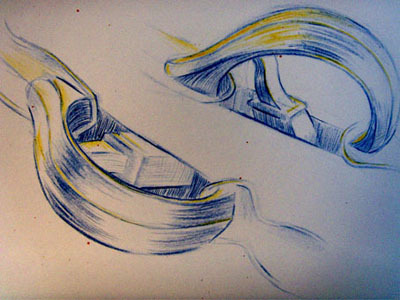 Overall it is more simple, in future I would use the same style but capture the entire object instead of just close ups. 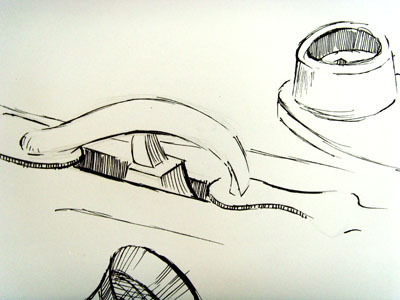 I used a red marker for these drawings, each time rotating the object slightly to try and draw the new perspective. I think they aren't too bad, but I may have rushed them slightly. I am still trying to adjust my drawing technique to balance time and quality. For these drawings I was trying to incorporate the surrounding objects, but I found it difficult to make the gun appear to be resting on these objects because of it's rigid structure. The end result looks more as if it has been superimposed on top. 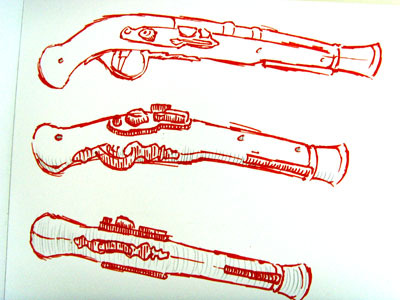 Still, I am pleased with how the actual gun turned out with these pencil drawings.